Making custom jewelry means the world to me. All my pieces are one of a kind, but knowing ahead of time that I’m making a bespoke piece, just for one special person, makes my day. It makes me think about Renaissance artists, when much of the art that was created was made by the artist for a patron. Many artists built a reputation this way, and the unique talent of the artist contributed to the stature and wealth of the important families who commissioned their work. At that time patronage was closely tied to the social status of elites- and that’s definitely not what I’m all about!- but it is fascinating to read about how the relationships between patrons and artists worked. Maybe there’s a way to bring the idea of patronage into a modern handmade jewelry business, minus the elitist attitude. Hmmm, something to ponder. I’m open to thoughts from readers! 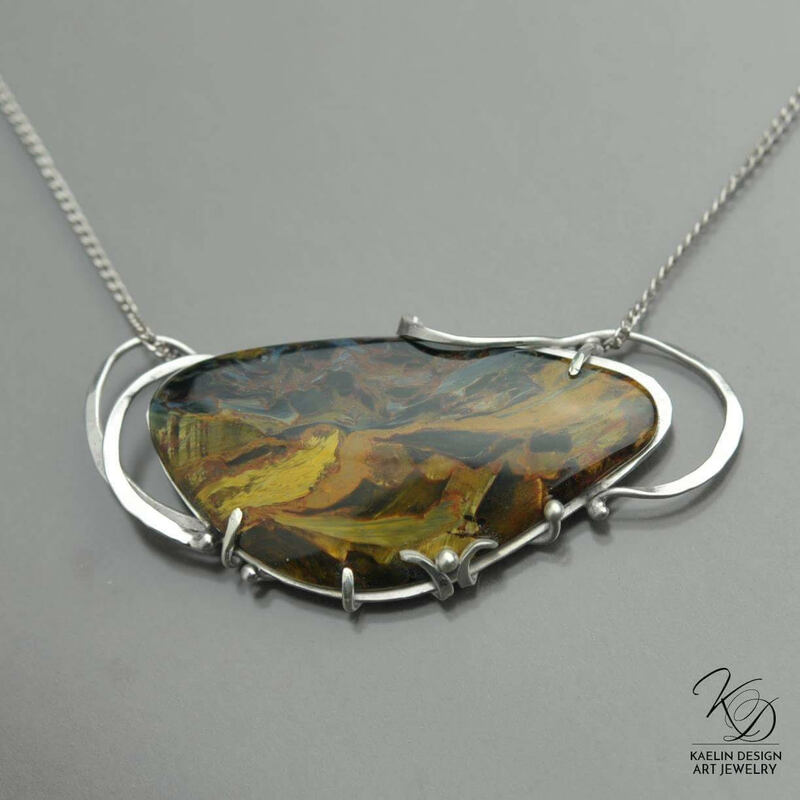 I think a one-of-a-kind piece made by an artist for a single person based on their needs is a more thoughtful and intimate approach to buying jewelry. When you take part in the process a little bit of you goes into the piece. It makes the end result that much more special, especially when you’re giving the finished jewelry to someone as a gift. Elven star You don’t have to be a fan of The Lord of the Rings to love a piece like this amazing Christmas gift, but it doesn’t hurt. Something Blue was a gift from me to my niece for her wedding. Christmas in Canada gave me the opportunity to design several custom jewelry pieces for the same family. Anam Cara is a story about friendship. Custom Alexandrite Pendant. I needed help deciding what to do with a gorgeous gemstone, and Mrs. Alex came through. The process is a bit more involved when you have custom jewelry made just for you, but it might surprise you to find out that it’s not always that much more expensive. It all depends on the materials and design you choose. Sometimes people aren’t even aware I offer custom jewelry services, and when they find out, they of course have lots of questions. I’m going to go through my process a bit, and answer the most common questions I receive. Making bespoke pieces always involves getting to know the client. When you contact me we’ll email or message back and forth until I get an idea of what you want and why you want one of my pieces. I’ll ask what stones, if any, you’d like and how big you’d like the piece to be. I’ll also try to get a feel for who you are, because that has an impact on my design. At this point we’ll discuss a ballpark budget, but you won’t pay anything until the design is finished and you’ve approved it. Clients come to me from all kinds of situations. Some have gems to place in settings, some want something special but aren’t quite sure how they want it to look, and some have a vision of what they’d like. You might see something in my catalog and fall in love with it, only to discover it’s already been sold. In that case, I can make something similar for you. I once did a pendant for a couple’s 25th wedding anniversary. They wanted a specific piece from my catalog that featured a very unusual druzy, but I’d already sold it. I had a sister stone in the same material, in a drastically different shape, so I offered to use that. We emailed back and forth about their life together, and talked about designs of mine that they both liked, and then drew up several ideas featuring both of their birthstones as an added personal touch. Maybe you have a gemstone that you’d like put into a setting. I will work with any materials you have, as long as you understand and accept that those materials could possibly be damaged during the creation process. I will also take apart anything I’ve already made to reuse a stone you’ve fallen in love with. Sometimes I can use finished or broken pieces you already own, but I’m pretty cautious about this. Tell me what you have in mind and I’ll assess it to see if it will work. You might know which gems and metals you like, but only have a vague idea of the sort of design you’d like, and leave that part up to me. You may also choose from material I have available. Like a specific stone? Let me know and I’ll send you pictures of the ones I have. Tell me what metals you prefer. 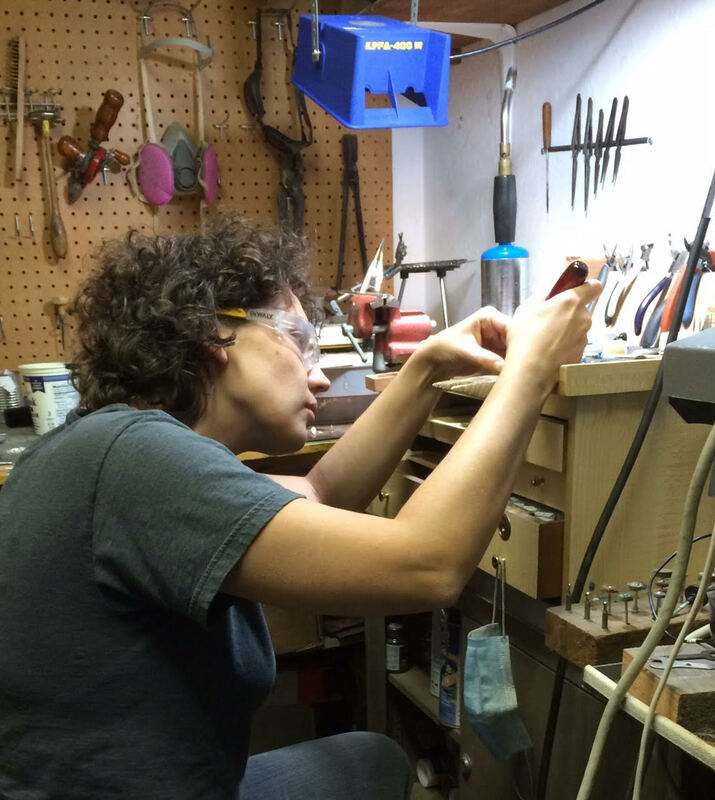 If that’s gold and you can’t afford a solid piece, there are ways to work within your budget. You won’t know what’s possible if you don’t ask, so tell me what you like and I’ll show you how it can work and how much it will cost. Whichever profile (or combinations of profiles) you fit, the first step is just to contact me and tell me a little bit about what you want, whether it’s via facebook or email. If you’re more comfortable speaking by phone, we can do that too. The next step is design. I sketch several design options with pen and paper, and email you a copy. If you don’t immediately fall in love with a design I’ll keep sketching until we find what you love, but usually by this point I have a pretty good idea of what you want so it’s very rare that I have to do a second batch of drawings. Although I’m making the piece for you and the jewelry is yours, I retain the copyright to the design itself, so I don’t charge you separately for the design services. Once you approve the design, I do an estimate for the materials then give you a quote for the piece (there’s more about cost in the section below). You pay half the cost up front, and the second half will be due when the piece is done and polished, and I’ve sent you photos of all angles for final approval. You then send me the rest of the payment, and I send you your finished piece. I’ll also keep you updated along the way, with photos of the stones when they arrive, and photos of the work in progress so that if you wish, you may provide feedback during construction. This is a collaborative process and I want you to be involved. I was stunned to hear about a story of a woman who commissioned an item from another jewelry designer. She thought she was getting jewelry custom made to her specifications, and instead received what the designer wanted to make and thought she should have. That is why I always make sure there is plenty of back and forth to find out what you want before I make your piece. How long this whole process takes depends on entirely on the design and the materials. In general, it’s a minimum of two weeks, but if I have to order stones or if materials are backordered, it can take quite a long time. Occasionally there’s a design problem. Because every custom design is new and untested, a design that works on paper may not be suited for a physical design, and it’s hard to know that until I actually try it. 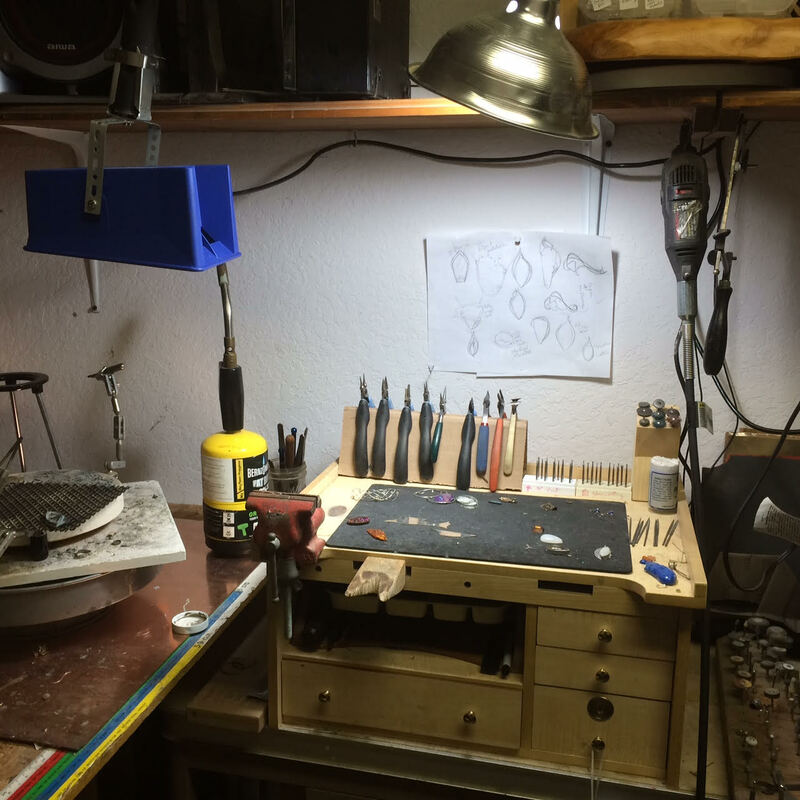 This is my jewelry bench- note the set of drawings on the wall! No one likes an expensive surprise, so I am very transparent about what your custom jewelry will cost. If there any unforeseen expenses, I let you know immediately, and discuss options. I also try and give options for cost variances. For example, with a custom anniversary order I had, I ordered several qualities of Emerald, and showed the client images of what they could have at different price points. Once you know what’s going into a piece of custom jewelry, the better you understand why it costs what it does. Metal prices fluctuate with the market, so if silver and gold prices are low when you order your piece, you’ll pay less, and if they’re high, you’ll pay more. Size. The larger the piece, the more material it takes and the more it will cost. Number of gemstones. The more gemstones you want, the more it costs. Process. The more involved the process used to make the jewelry, the more time it takes and the more it will cost. Very simple pieces, like basic earrings or a forged ring, can cost less than $50. A bezel set piece, where a band of metal goes around the circumference of a domed stone, is somewhere in the neighborhood of $100. Anything with a large prong setting (where arms of metal hold a faceted stone in place) costs at least $150. A simple small gold piece is at least $450 at today’s prices, but could be more or less than that in the future depending on what happens in the markets. The last custom gold piece I made included some very nice gemstones, and it cost the client $2500. As you can see, custom jewelry prices vary a lot, so it’s very important for me to know your budget range before we get started. Bottom line: If you want a piece of jewelry custom designed just for you or for someone special, reach out and say hello. I’m happy to hear from you and answer your questions. Thinking of giving someone special jewelry this Christmas? Contact me very soon, because I’m only taking orders until the middle of November, and I don’t want you to miss out!